Microsoft executive, Aaron Greenberg, dismissed claims that Project Natal was like Sony's Eye Toy and stated that its development will continue five years after its release. Aaron Greenberg is Microsoft's Director of Product Management for Xbox 360 and Xbox LIVE. He responded to accusations from the press at Microsofts's X10 event in San Francisco last week that Project Natal was just a trumped up version of Sony's Eye Toy. 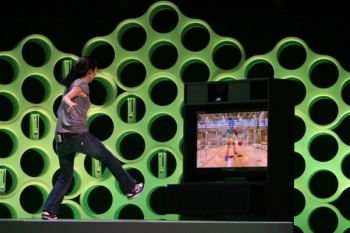 Greenberg wants gamers to think of Natal as more than just a motion control system, pointing to the facial recognition and full-body tracking it offers. He also mentioned that he expects developers to continue working on Natal for years to come. We had an opportunity here to really do something that's transformative and brings a whole new category of experiences to life. We can see when you move your hand, when you move your feet, we can track your body. I can stand in front of this sensor and it can recognize my face and know if it's me, or my brother or my sister. The richness of the technology is going to really enable experiences that never had existed before. And we're not just speaking about what we're doing this year, but I think two, three, four, five years from now as this evolves. Millions of consumers this Holiday will be able to experience Project Natal and this is just the beginning of something that will change the way consumers interact with entertainment and change way our publishing partners think about game development. It certainly appears that Microsoft is shooting the moon with Natal. Rather than chase Nintendo with a Wii knock off, they want to offer something that will be truly new and innovative. Now we just have to see if it's worth the years of hype. Natal is due out this holiday season, but I predict there will be about 14 million more claims from Microsoft that it will be revolutionary.